On the heels of Intel releasing their 8th Generation Core processors in late 2017, OEMs hustled to get their next generation of desktops and laptops ready to accept that shiny new object. The new CPUs mean additional cores, and in many cases, faster clock speeds promising better performance across a multitude of applications. These updates have, in turn, reached a peak with last week's release of the rest of the 8th gen CPUs, leading to what we have seen over the past several days from Dell, MSI, and others with updated gaming lines, workstations, laptops/2-in-1's and more. To that end, HP is joining the group refreshing several lineups including Pavilion/Pavilion Gaming desktops and laptops, a Chromebook 2-in-1, as well as a new 32" monitor with HDR. We are seeing hex-cores where quad-cores used to be, and quad-cores where duals were with processors from both Intel and AMD as the weapons of choice. 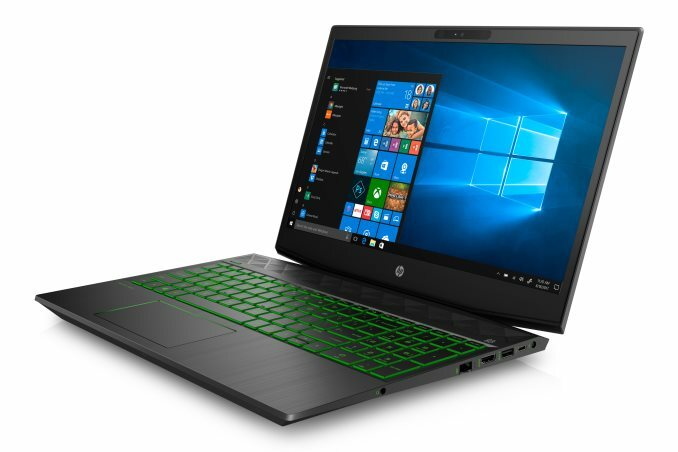 HP slots the Pavilion Gaming lineup as a more affordable path for a gaming machine and wants to bring down some premium features into that lower price point with some of their latest offerings. On the desktop side of matters, HP is unveiling their latest updates to the Pavilion Gaming lines with the introduction of the Pavilion 690 and Pavilion 790. The Pavilion Gaming lineup is intended to court the mainstream gamers – those who aren’t really part of the DIY market and are indifferent to having a customizable ecosystem. The key differences between the updated lines lay in the size of the case, and video cards used as well as overall performance. The 690 is the smaller chassis of the two with a 15L internal capacity and starts with an AMD Ryzen APU/AMD video card configuration. The 790 is 33% larger internally at 20L capacity, uses an 8th Gen Intel CPUs and AMD/NVIDIA video card options (supports a faster NVIDIA based GPU on the high end). 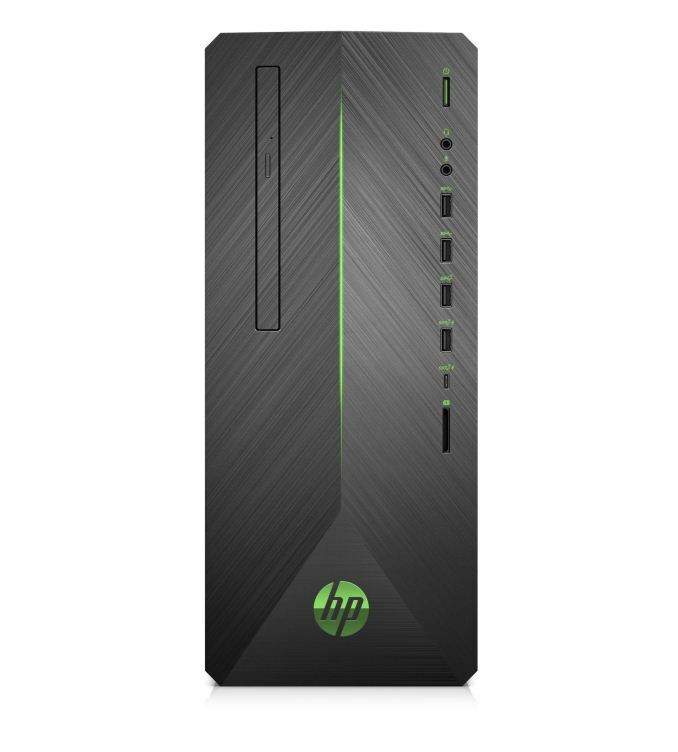 Both, HP says, offer the latest technology and the ability to upgrade along with a bold design separating itself from the non-gaming Pavilion desktop and laptop lineups. The updated ‘shadow black’ chassis has an angular design with angular cut bezels and a brushed aluminum finish giving the case a 3D two-tone effect on the front. Also on the front is a green LED strip in the center along with green power buttons, port labels, and a green HP logo on the bottom. It’s clear there is an aesthetic separation between the two lines. The Pavilion 690 chassis measures in at 6.7” x 11.02” x 13.30” (W x D x H) and is able to support up to three storage devices, half-length video cards (up to RX 580), and two DRAM slots (supports up to 32GB). There is a free PCIe x1 slot and M.2 slot inside. The 790 chassis measures in at 6.06” x 14.08” x 14.52” (W x D x H) and will support full-length graphics cards, up to four storage devices, and four DRAM slots (up to 64GB). Inside the 790 are two free PCIe x1 slots as well as a PCIe x4 slot. If multi-GPU is needed, users will have to step up to an Omen or Omen X based desktop. On the hardware side of things, the 690 uses a quad-core AMD Ryzen 3 2200G processor running at a base clock of 3.5 GHz with a maximum boost up to 3.7 GHz. Maximum CPU support is up to an Intel Core i7-8700. The base configuration comes with 8 GB DDR4-2400 memory in an unfortunate single-channel 1 x 8 GB setup, expandable to 32 GB (2 x 16GB). Storage starts off with a single 1 TB 7200 RPM SATA hard drive with PCIe NVMe and SATA based M.2 drives optional. Storage capacity is up to 3.5 TB when using a 512 GB SSD + 3TB HDD combination. Pushing pixels here is the AMD Radeon RX 550 4 GB as the base model, with upgrade options including NVIDIA's GeForce GTX 1060 3 GB or AMD's Radeon RX 580 8 GB. The 790, on the other hand, uses a hex-core 8th Generation Intel Core i5-8400, which has a base clock of 2.8 GHz and a maximum turbo frequency of 4 GHz. Its fastest processor is also the i7-8700. 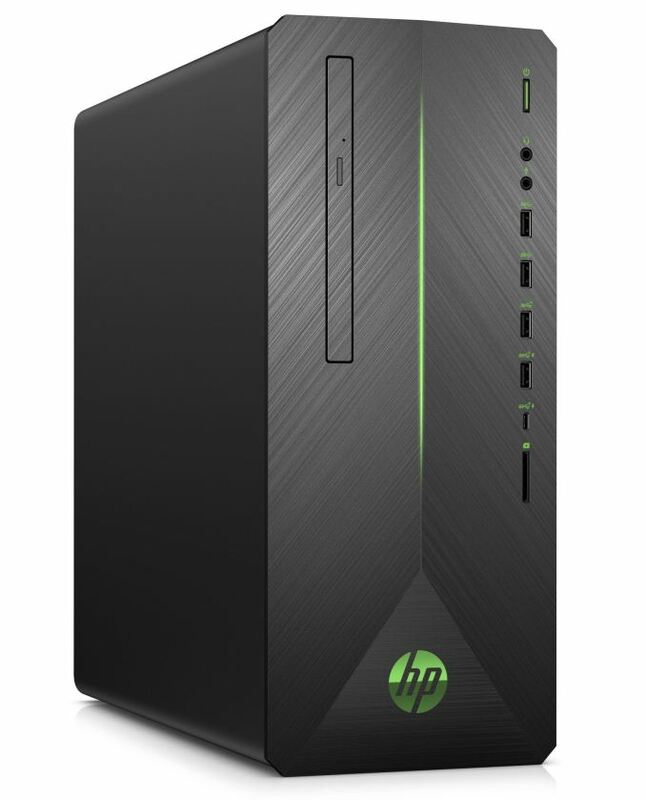 The base configuration here is also 1 x 8 GB but the 790 uses the slightly faster DDR4-2666 memory. Memory capacity is expandable to 64 GB (4 x 16 GB), double the 690. The base storage configuration is a 256 GB PCIe NVMe M.2 drive. There are a total of three 3.5” drives and two M.2 slots to mix and match configurations with a swing out HDD tray for easy storage additions. For video cards, the 790 starts off with the NVIDIA GeForce GTX 1050 and goes up to a GTX 1080 8 GB or a RX 580 8GB. Connectivity and networking configurations are also similar with both the 690 and 790 offering users a wired Gigabit Ethernet port as well as 802.11ac 1x1 Wi-Fi and Bluetooth 4.2 support. 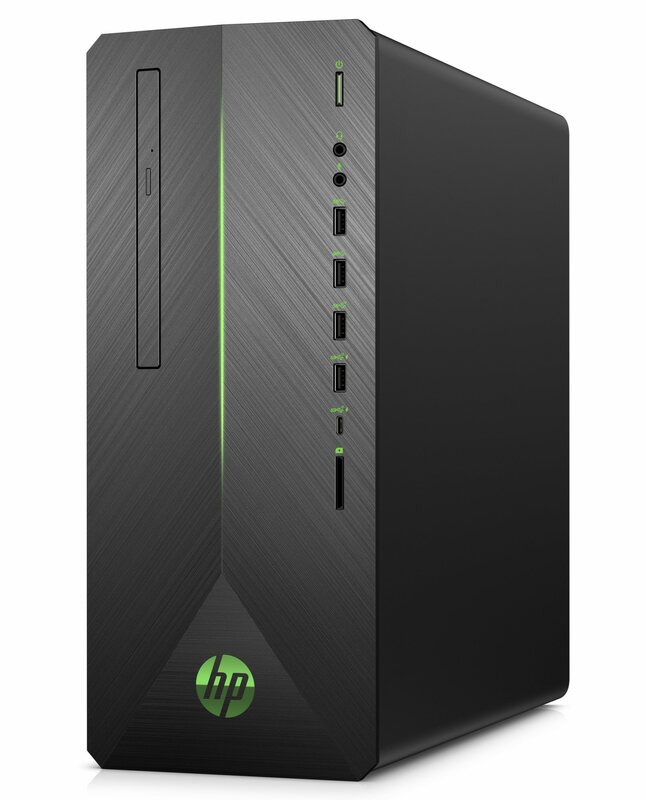 Both boxes include a legacy optical drive, two USB 3.1 ports, USB 3.0 Type-C port, as well as an HP 3-in-1 card reader. On the back, both have two USB 2.0 ports and four USB 3.0 ports. The 790 adds two USB 3.0 Type-A ports on the front as well as splitting out the audio combo jack to a headphone and microphone jacks. The video outputs on the 690 consist of a single HDMI port and DisplayPort while the 790 has VGA, HDMI. Other options will vary by the video card chosen. There are no details on the specific audio codecs used, but it is 5.1 surround capable. Both units use HP Audio Stream functionality which will allow you to connect your phone to the PC via Bluetooth and stream audio from your phone to your PC speakers – a pretty cool value-add feature. The Pavilion Gaming 690 with AMD Ryzen and RX 500 combination starts at $549 while the base 790 with Intel i5-8400 and NVIDIA GTX 1050 will start off at $749. We can expect to see these online and on store shelves in the May/June timeframe. (L x W x H) 11.02" x 6.69" x 13.30" 14.79" x 6.06" x 14.37"
On the mobile side of Pavilion Gaming, HP brought out two options, the first - the 15-cx0020nr - is intended for those who may be more price-sensitive. 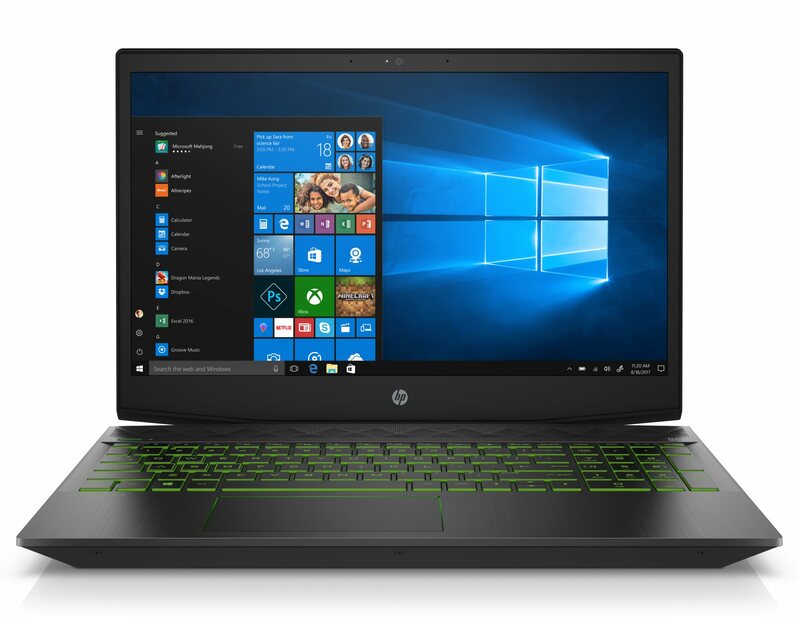 This laptop includes a “U” series Intel CPU and is paired with NVIDIA's GeForce GTX 1050 as its only graphics option. The higher-end 15-cx0030nr will an 8th Generation Intel CPU along with video card choices going up to a GTX 1060 Max-Q or AMD's new Radeon RX 560X. The options in the Pavilion lineup do a good job not stepping on the toes of their Omen and Omen X lineups by limiting the higher end options. The Omen lineups are intended to scale better, have more aggressive design aesthetics and a full complement of hardware options to choose from as well as a more thorough and customizable ecosystem. The Pavilion Gaming laptops intend to fill that gap with a more palatable pricing format as well as hardware to perform its intended function. 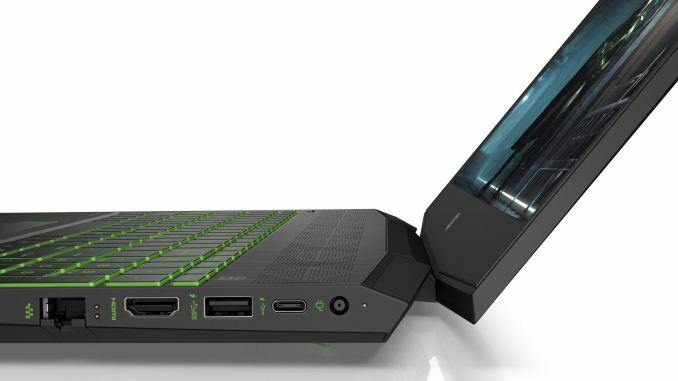 The design of the Pavilion Gaming laptops, as with the desktops, set themselves apart from the non-gaming Pavilion laptops. With the top closed, the black chassis is fairly non-descript outside of the larger exhaust vents on the rear. The monitor has a narrow border design (a signature element) along with an aluminum keyboard deck. The 30nr will come in three colors, Ghost White, Acid Green, or Ultraviolet (exclusive to HP) with the backlit keyboard color to match. The side bezels are 9.8mm on the side and 16.14mm on top which can shrink the overall size of the laptop. The angular design has a focus on venting and thermal performance to help keep the hardware cool inside with its dual cooling fans moved to the edge to allow for better airflow across the components. The now-familiar signature geometric faceted speaker grille finds its way to the Pavilion Gaming laptops as well as being found on all other pavilion laptops. Along with the aforementioned quad and hex-core options for the various Pavilion 15 models, the 0030 model also includes Intel 8th Generation i+ options which include Intel Optane memory. Video card solutions range from a NVIDIA GeForce GTX 1050 or AMD RX 560X, up to a NVIDIA GTX 1060 Max-Q. RAM appears to max out at 8GB of DDR4-2666 in 1x8 GB configuration. The Memory slot is not user accessible so at first glance it appears 16 GB is out of the question on the Pavilion Gaming Laptops this generation. Storage options range from a 1 TB 5400 RPM hard drive and 128 GB PCIe NVMe M.2 SSD for a total of 2.1 TB with a 128 GB SSD and 2 TB HDD. There are three monitor choices, a FHD (1920x1080) 60 Hz display, FHD 144 Hz display, or 4K UHD options. For networking and connectivity, there is a Gigabit LAN port along with 802.11ac 2x2 Wi-Fi and Bluetooth 4.2. In addition, HP offers optional Wi-Fi supporting up to Gigabit speeds. External ports include a single USB 3.0 Type-C port, two USB 3.0 ports, HDMI for video, RJ-45, multi-format digital media card reader as well as a headphone/microphone combo jack. Last, audio functionality is handled by dual stereo speakers with Bang & Olufsen Play support. The “U” series based SKU is only available in select markets – no price listed. Base price for a i5-8350H/ Radeon RX 560X/1080p 60 Hz display/1 TB HDD + 16GB Optane starts at $799. The Pavilion Gaming laptops will also be available in the late May or June timeframe both online and in-store. (W x D x H) 14.40" x 10.01" x 1.00" 14.40" x 10.01" x 1.00"